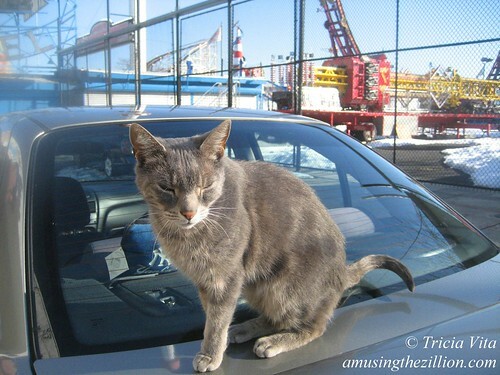 In February we dropped by the Bowery to visit Target the Coney Island Arcade Cat & His Friend Pretty. When the games are open for business, the gregarious Target is likely to be found sitting on the counter of the Balloon Dart. Even in the winter, he can be seen making his rounds. In March, ATZ posted historian and Coney Island History Project director Charles Denson’s latest video “Cyclone Roller Coaster: Four Seasons.” This behind-the-scenes look at Coney Island’s landmark roller coaster lets you walk the tracks – summer and winter – and get up close to the machinery in the motor room. In March, ATZ learned via twitter that Coney Island’s Inexhaustible Cow, a 19th century attraction which dispensed milk for 5 cents a cup, had apparently survived. A Pennsylvania dealer of Americana was selling the wooden cow (milk not included) for $78,000. In Inexhaustible Cows & Bottomless Cups of Chocolate Milk, we looked into the history of the Coney Island cows –there was more than one–and reminisced about bottomless cups of chocolate milk for a quarter at the Michigan State Fair. If you’re adept at reading letters backwards you’ll like this Flickr Slide Show: DNALSI YENOC –> CONEY ISLAND. The letters frame the view from Stillwell Terminal as visitors exit onto Surf Avenue. DNALSI YENOC is also the name of a flickr group started by Coney Island photographer Barry Yanowitz. The collection of photos document the view, which changed irrevocably in 2010 when the Henderson Building and Shore Hotel across the avenue were demolished by Thor Equities. A new building –touted as “The Retail Ride of a Lifetime” by Thor– is now rising on the empty lot. One of our favorite photos of the summer of 2011 is this Photo of the Day: Umbrellas on Coney Island Beach. On the Fourth of July, photographer Jim McDonnell took this amazing shot of Coney Island’s beach brimming with colorful umbrellas. “The 4th itself started out hazy but turned hot, humid and incredibly crowded!” he said.